One of the top concerns in the political arena today is student debt. That’s regardless of political affiliation, and it’s a consistent concern for millennials across the board, with very few exceptions. It seems that no one is happy about this, but there is very little one can currently do about it. People have claimed to owe as much as $44,000 in loans for a public school, but one usually assumes that those are select cases. How much do Americans really pay for a public college education? And more importantly, how much has tuition increased from year to year? The data collected here from the College Board exclusively counts in-state tuition at public four-year institutions. These public school rates, which one would normally assume to be consistently low, have seen unusual spikes since the last economic recession. Out of the 50 states, 11 of those saw average in-state tuition and fees at public schools jump by an outlandish 20 percent or more within five years. That means that within an amount of time only a little more than the time it takes for a freshman to graduate, tuition prices at numerous public four-year schools across the country have increased by at least a fifth. (Perhaps it’s time to go to school in Maine, which is the only state where the average in-state tuition for public four-year schools actually decreased.) Considering that public in-state tuition is often the lowest option for graduating high school seniors, this type of increase has had a big impact on many families across all 50 states. 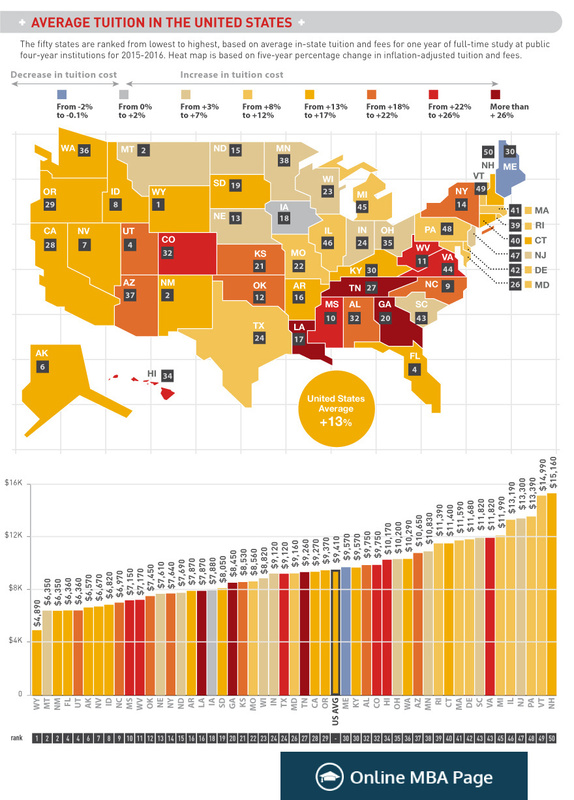 Some of the best states on this list in terms of keeping tuition low are Iowa, Maine, Montana, North Dakota, Nebraska, Wisconsin, Indiana, Ohio, South Carolina, and New Jersey, and some of the worst offenders are Georgia, Tennessee, Colorado, Virginia, West Virginia, Hawaii, and Louisiana. Louisiana is particularly of note, since the average tuition there increased by a jaw-dropping 52 percent in five years. That being said, Louisiana still has a fairly low average tuition, at only $7,870. That’s lower than the super-stable Maine average tuition of $9,570, which is still lower than the national average of $9,410. Those living in Vermont and New Hampshire will pay the most, whereas locals in Wyoming and Montana will pay the least. One of the all-around worst states for in-state tuition may be Virginia, which both has a high average price tag, $11,820, and increased that cost by 23 percent in five years. It could also be New Hampshire, which only increased its cost by 16 percent but packs a hefty price tag at $15,160. The national average for public-school tuition increases is 13 percent, creating a very unstable financial situation for graduating high school seniors. But how many people does this really affect, and how many people actually get to finish their college degrees? High or fluctuating tuition prices can be a roadblock to education attainment, which is another fluctuating figure Americans need to consider. The two maps don’t line up perfectly due to the fact that many students cross borders to attend private schools and due to numerous other socioeconomic factors. That being said, this 2009 census data shows a few correlations. “Problem children” states like Louisiana sometimes also rank poorly for statistics on education attainment; Louisiana ranks 48 out of 51 (including the District of Columbia) for the percentage of the population with an advanced degree and 45 out of 51 in the number of those with a bachelor’s degree. Conversely, other demons of the study may have done well in education attainment, like the pricey and volatile Virginia, which has relatively high percentages of 34 percent of the population with a bachelor’s degree and 14.1 percent with a more advanced degree (ranking 6 out of 51 and 4 out of 51 respectively). This graphic is ranked in terms of states with the highest percentages of the population having an advanced degree (meaning a master’s degree, Ph.D, or some other type of post-undergraduate degree), with the top-ranked places being the District of Columbia and Massachusetts and the lowest being West Virginia and Arkansas. Those four states are in the same positions when it comes to the percentage of the population with a bachelor’s degree as well. For high school completion, though, the best is Wyoming, with a commendable 91.8 percent, and the worst is Texas, with a humiliating 79.9 percent. The national average is 85.3 percent of the population with high school diplomas, 27.9 percent with bachelor’s degrees, and 10.3 percent with advanced degrees. These averages are low considering that many big-name companies in the technology industry bemoan the fact that they need a skilled workforce in the U.S. and often are forced to outsource. The National Center For Education Statistics notes that as many as 65.9 percent of graduating high school students enrolled in college in the fall of 2013, and a total of 20.2 million people were expected to be attending college in 2015. A large chunk of the population is therefore affected by rapidly increasing tuition prices. This is possibly why the goals of most political candidates often include to both increase the percentage of people earning college degrees in every state and to keep in-state tuition costs for public schools consistently low. In the future, hopefully there will be better numbers to look at.